On Saturday March 30th from 8.30pm to 9.30pm millions of people around the planet will take part in WWF’s Earth Hour. By turning off non-essential lights for one hour, people can demonstrate their care and concern for the environment in a collective worldwide effort. Mayo County Council will be powering down and we would like you to join us. 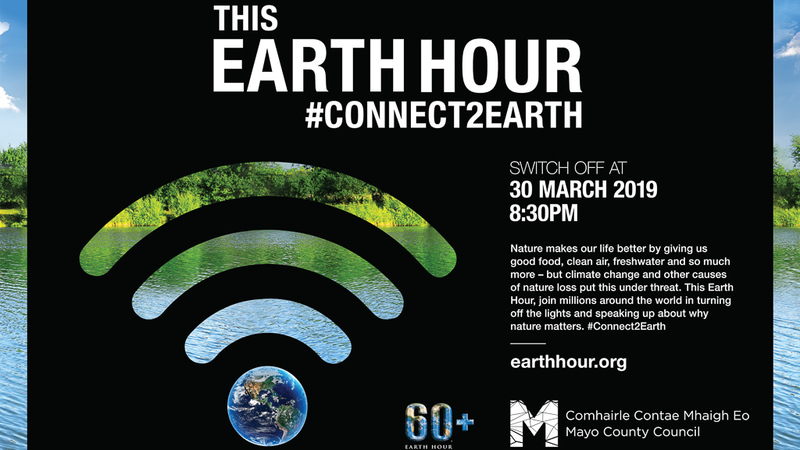 Mayo County Council will be using Earth Hour as their launch pad for Climate Action Month. During the month of April Mayo County Council will focus on a climate action theme every week including biodiversity to correspond with Tree Week (31st March – 7th April), Plastic and waste, energy and transport. Climate Action month will come to a close on Mayo day in Turlough House. Wild Nephin Ballycroy National Park will host Earth Hour Event in the Letterkeen bothy/Brogan Carroll bothy at the Letterkeen Loop Walk area of the park near Newport on Saturday 30th March. There will be tales by the candlelight as the lights will be switched off off followed by stargazing in Mayo’s Dark Sky Park.